This post started out as a Halloween post...to explain how you can get great images of your carved pumpkins...until I realized that I haven't shot any flickering carved pumpkins on digital! Sheesh! So...this post will be about carved pumpkins...but explained by images that are from a girls' retreat at St. Andrew's and my all-time favorite candlelight place...Relay For Life. Your flash must be off. If you are exposing for longer than 1/125 of a second (on average), there's a very good chance your image will be blurry unless you steady your camera by placing it on a tripod, a table, or the ground. Something steady. A stable tripod (or tripod like setting) creates sharper pictures by reducing vibration. If your digital camera has Image Stabilization - this is the perfect time to use it! In general, you'll need to increase your shutter speed (more on that later) and open up your aperture. Take a look at the examples below. Simply - you are trying to pull all the light from the subject into your camera - it may take longer (thus, the longer shutter speed) if there isn't a good deal of light. Opening up your lens (the aperture) will also allow as much light in as possible. 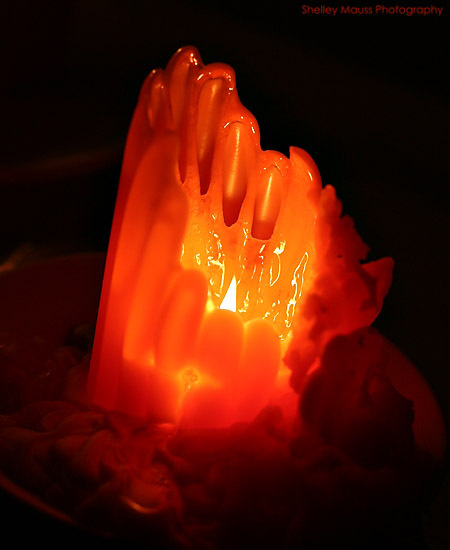 I love what candles do when they're hot and melty and glowing. For each of these shots, I focused on the glowing wick and cropped everything else out. By focusing on just the wick, it allowed the glow to take center stage in these photos - meaning the background faded to black pretty quickly. the specs: ISO 400, F/2.8, 1/200 sec. Luminaria is one of my most favorite times of Relay. 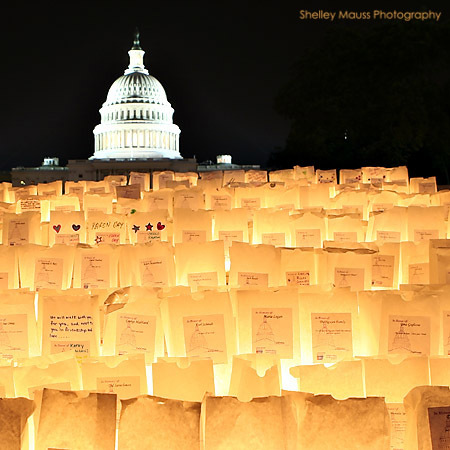 Each white bag is filled with sand and a candle, and the bag holds the name of a person with cancer. 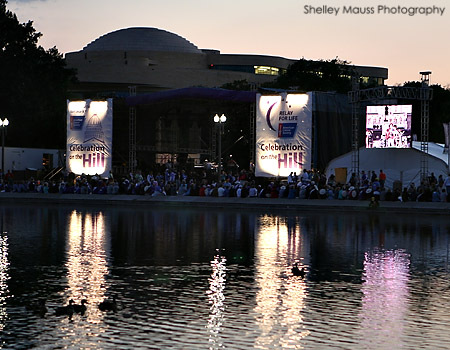 There's a beautiful candlelight ceremony, and the Relayers walk for the rest of the night around the track - using only the candlelight to light their steps. It's simply beautiful. One of the tricky challenges at Relay is to get a good shot with so many people moving about. However, you can use that to your advantage. Let's take a look at a few stationery shots. These luminaria were handcrafted by the amazing CJ Jensen on Team BCRA. To capture the shot, I sat down in front of them, set the camera on the ground, and angled the lens up slightly by putting the camera strap underneath the lens. Highly technical, I know! :) It allowed the names to be sharp focus, and you can even see the sand along the bottom of the bag. the specs: ISO 400, F/2.8, 1/13 sec. the specs: ISO 400, F/2.8, 1/25 sec. 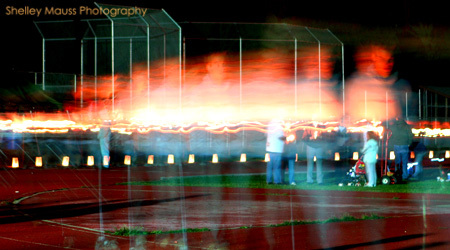 This is one of my most favorite "moving" luminaria images. It's "Canadian Ben" who volunteered for the Canadian Cancer Society. 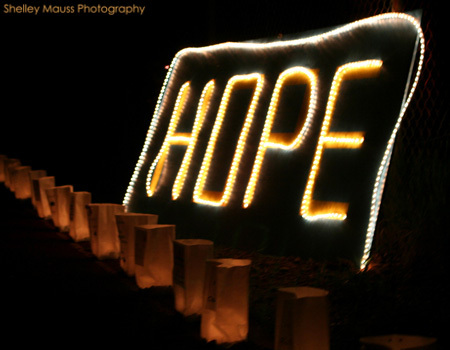 :) At this Relay, the Relayers walk the track holding a candle. I set the camera on the bleachers, focused on him, and let it expose for 8 seconds. The result? 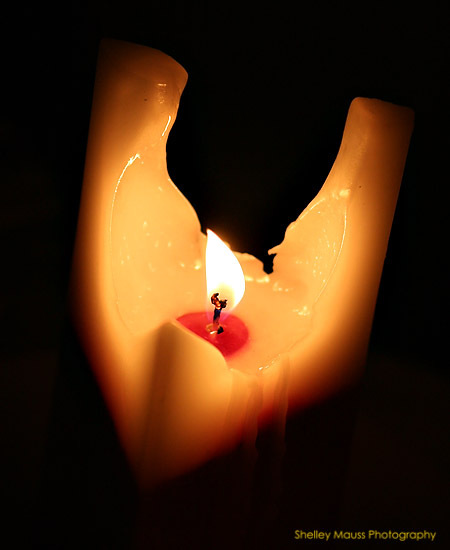 His candle that he was carrying made a steady (or bumpy, by the look of his steps) stream of light. Because he was moving around the track, you could still see the luminaria behind him. the specs: ISO 400, F/2.8, 8 sec. So much to photograph...especially at night. 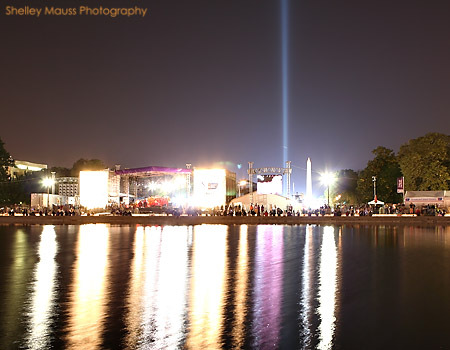 Not simply luminaria, but the capitol, the reflecting pool...I was in heaven. And it didn't hurt that the evening's festivities were led by the beautiful singing of a friend of mine, Diana Miller, who sang "This little light of mine" to 15,000+ people. the specs: ISO 400, F/2.8, 1/80 sec. Later on in the evening, I wanted to capture the spotlight into the night sky, and the glittering of the lights, luminaria, and main stage...which meant I needed to expose the image for longer. This shot was for 15 seconds - and the logos are all but blown out by the bright light that's filled the shot. If I was shooting for the logos - it would have been over exposed. But I love all the light...so I'm good with how it turned out. the specs: ISO 100, F/5.6, 15 sec. A good comparison of overexposure. 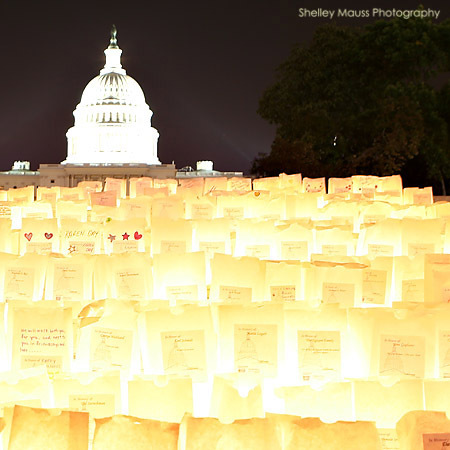 The luminaria on the steps, with the Capitol behind them. Check out the differences between the 2 shots - the first exposed for 10 seconds, and the second for 3.2 seconds. For this image - the details are important. The names are important. 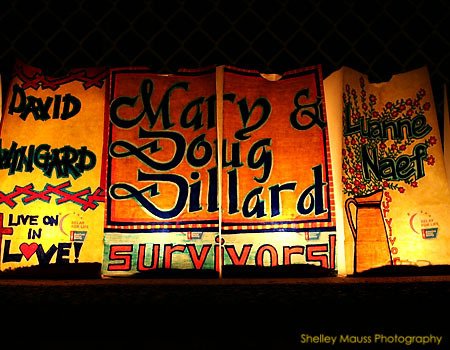 With the longer exposure, you can't make the names on the luminaria out anymore. By shortening the exposure time - the light didn't blow out and the luminaria retained a deep, golden glow. the specs: ISO 100, F/5.6, 10 sec. the specs: ISO 100, F/5.6, 3.2 sec. While I was shooting the capitol with its lights, this super annoying lady came up to ask me what I was doing and wouldn't move when I kept telling her she was in the way. Grrr! See her red flashing pin she had on her chest? Since I wasn't holding the camera, she couldn't believe that it could be taking a photo - so she stood right in front of it. 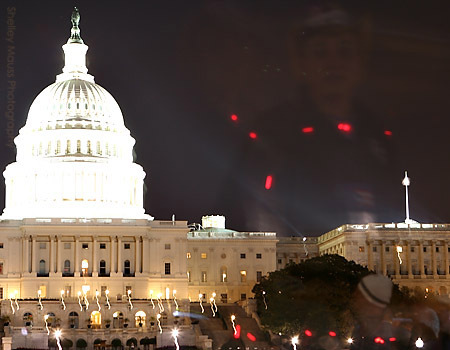 So now I have the Capitol with cool streaky lights - and her ghostly presence, reminding me that she is still there! the specs: ISO 100, F/5.6, 13 sec.